Everything's posted now - a veritable smorgasbord of monstrous writing tips and background insights. Hey DC, Monster School was AWESOME! Good luck on your tour, can't wait to read more of your books! Your comment was pretty awesome too - and just what this author needed! 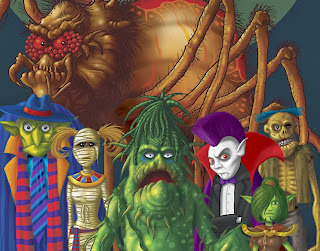 Plus handy links for buying Monster School in kindle or paperback format. The blog gave me idea about components of Python.They explained in effective manner.Thanks for sharing it. Keep sharing more blogs. Thanks for sharing the best story with us. I have shared best friend story, this is based on two very special little animals, how they meet with each other after they lost in the mist. We highly recommend parents and kids to buy this book, read the full story of Quacker and Striper.